Given the cyclical nature of ocean oscillations, solar activity, orbital parameters, etc combining in chaotic ways yet interrelated, what is the predominant cyclical component in temperature data on relatively short time scales of say 30-80 years? Plotting HADCRUT3 variance-adj global mean data with a 2-5 harmonic (~32-80 year) band-pass filter and then plotting the inverse fourier reconstruction below shows the 2 most recent cycles 1883.75-1937.75 lasting 54 years and 1937.75-1999.25 lasting 61.5 years. 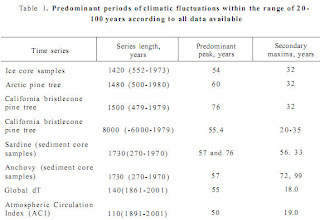 The publication Climate Changes and Fish Productivity analyzed three 1500-year temperature proxies including ice cores and tree rings, and found the predominant periodicity of climate fluctuations during the last 1000 years to be ~60 years with the variation from 55-76 years. 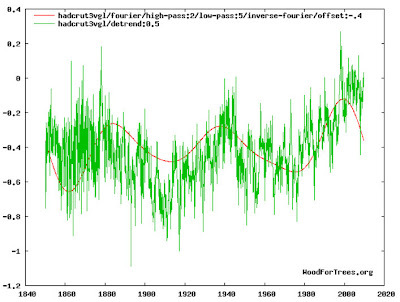 This same periodicity was also confirmed by other authors. Given the typical cycle length of ~60 years, the present cycle won't peak until ~2059. BTW, fish stocks of all species studied explodes on the upside every time the planet warms. More good news about GW! Nice website you have. Best of luck & keep me posted.